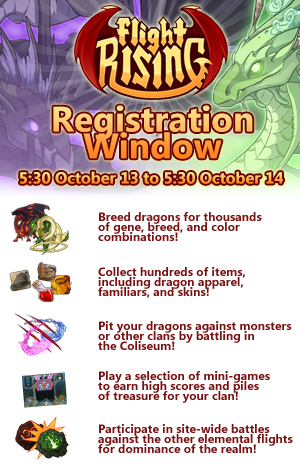 yes, for all of you wanting to join Flight Rising, registration will be open October 13th! What timezone would it be in, though? I think I've seen this before- Squints. I feel the same way. But they're not taking sign ups anymore haha. Too many people joining at once I guess. I think I might have played this before. A long time ago. Was it under construction for a while and then just reopened now or something? Flight Rising Registration Temporarily Closed. Flight Rising is growing at a pace that's too rapid for our servers to handle. At this time we are not accepting new player registrations. We will be open for new player sign ups in the near future, and can't wait to have you join in the adventure! Surprisingly I actually remember my CS. I don't go on there, but sometimes I'll do the occasional check. But I don't really do anything on there. I remember I got it a long time ago. 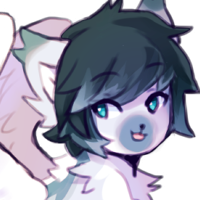 Flight Rising will have a NEW registration window on December 15th! If you're interested in opening an account, Registration will be available at 05:30 Server Time on Monday December 15, and close at 05:30 Server Time on Tuesday, December 16. We're also welcoming two new moderates on Flight Rising! Please give a warm welcome to Barbie and Nerd. Don't forget guys! Registration opens in 4 days, so make sure you're ready! You never know when the next slot will open. Donnie. Why you not add me on FR? Username is Fai - everyone feel free.